Cetologists have noted an unusual characteristic of the smaller Whale(r)s. Their ventral surfaces are all nearly identical, varying in length from about 13 to 17 feet, while the dorsal area has shown amazing evolutionary variety. In this installment of CETACEA, we examine more closely some of this variation in dorsal surface shape of the minor cetaceans. 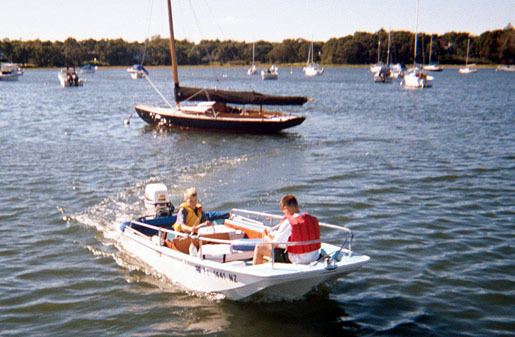 "I am sending you a single photo of my recent [capture] of a 16-foot 7-inch STRIPER, [tagged] by Fishermarine in 1971 "Hull ID: 3A4684", and including the original 1971 Johnson 100-HP outboard. The last [keeper] had this Striper on a trailer for nearly 10 years unused and it still runs! "I have taken off the center console and front rear seats for some cleaning, and I will be installing a newer 70-HP Johnson. 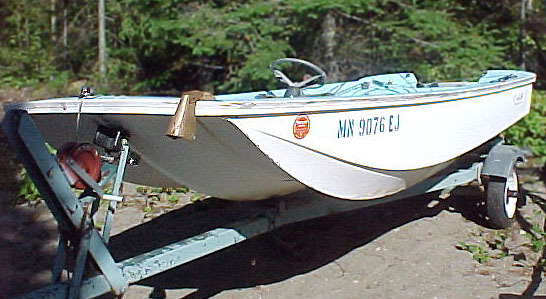 I plan on doing some restoration as time and cash permit, but I gotta be on the water too!" This minor cetacean had been dormant for almost a decade, stranded on this trailer. Under the care of Andrew Michie a revival is being attempted and there is hope that the Whale(r) can again become proficient in the capture of smaller fish. 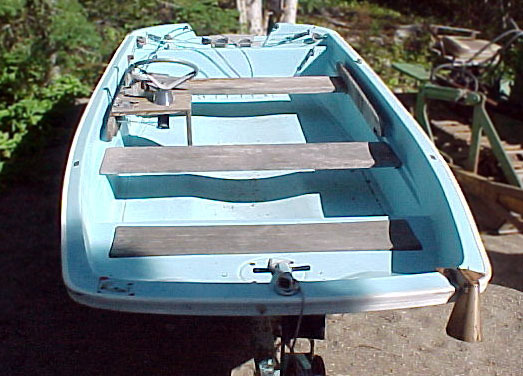 The dorsal area of this Striper sub-species features a small front deck and a swivel casting chair forward, a center console in the stern. "The following two pictures were taken in September 2000 of my sons RJ and Andrew [in company with] their 40th Anniversary Edition 13-foot Whale(r). At the time, they were 9 and 11. They're learning alot on this Whale(r): responsibility, accountability, seamanship and a love of the outdoors. 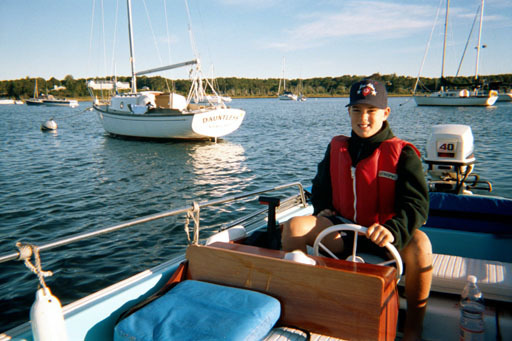 As a Navy family, we've blasted around SF Bay, Lake Tahoe, Yellowstone Lake, Jackson Lake at Grand Teton, Nantucket Sound and numerous lakes and ponds. These pictures were taken in East Bay in Osterville, MA. during an awesome father and son outing!." Cetologists first sighted the Whale(r) in 1958. Since then they have noted continual and rapid evolution in both the size and shape of the Whale(r), but in 1998 there was a sudden appearance of minor Whale(r)s with nearly identical dorsal and ventral surfaces as the original, as well as a sudden and unexplained return to the original coloration along the dorsal surface, a pleasant light-blue. Much like the original Whale(r)s, the blue coloration seems to be an irresistable attraction for younger human males, luring them aboard and making it difficult to get them to return to land again! The smaller Whale(r)s can generally be found in shallow salt water, where they particularly like to swim among moored boats. In this view we can see evidence of the quick manueverability of these smaller cetaceans. This one has attracted two young boys aboard, a very common occurence with these blue colored Whale(r)s. These creatures are so docile that they even allow pilots as young as nine-year-old Andrew to take control. Note the reappearance of the unusual nose appendage, thought to be illuminated while swimming after dark. The unusual blue dorsal coloration can be seen in this view. Also note the striated off-white markings in certain bands, which cetologists catalogue as the "Tan Pleat Cushion Option." While this Whale(r) displays the atavistic blue color, in other details it retains the evolutionary refinements of its newer cousins, such as improved and more powerful propulsion mechanisms and more efficient steering control linkages. Judging from the expression on its companion RJ, riding with this Whale(r) is a fun experience! Minnesotan Don Stocks who owns and runs Jackpine Lodge in northern Minnesota sent several nice photographs of a 13-foot specimen of 1966 Whale(r) which migrated to the north-central United States and became stranded in the woods. Apparently, the propulsion mechanism atrophied and fell off. After many years out of water, the surface skin dried, with certain portions fading to a gray, wooden tone. However, the recuperative powers of this species of minor cetacean is amazing, and there is no doubt that given some nurturing care and feeding, this Whale(r) could be restored to full health. Don is interested in selling this cetacean, so if you'd like to care for it, please contact him. The distinguishing shape of the original small Whale(r)'s ventral surface and nose can be seen on this specimen, a fine example of the species origin. The simplicity of the original small Whale(r) can be seen in this overhead view of its dorsal surface. Many evolutionary developments have occured since this 1966 specimen was bred, yet there is much to be said for the utility and function of this genus of the species. The page has been accessed 48118 times.